I don’t say this lightly. 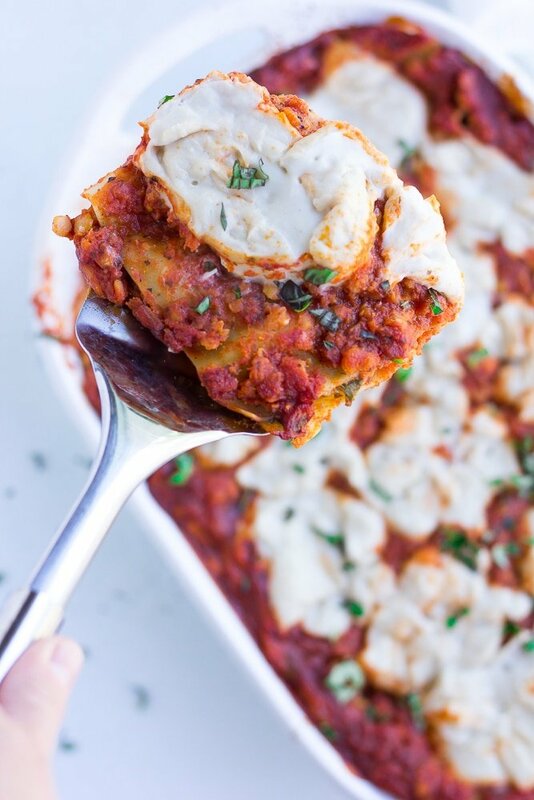 This truly is the BEST Vegan Lasagna! 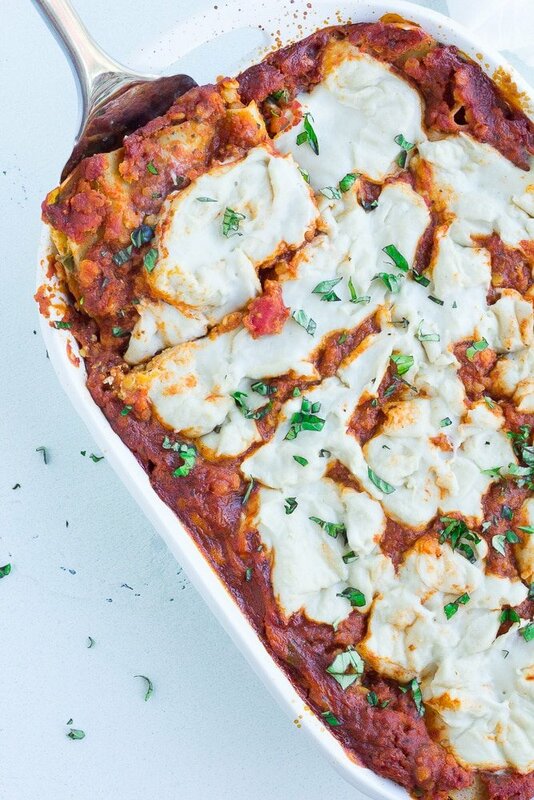 Layered with a tofu-cashew ricotta, red lentil marinara and loads of fresh spinach, this lasagna is protein packed with 26 grams per serving and is sure to satisfy! 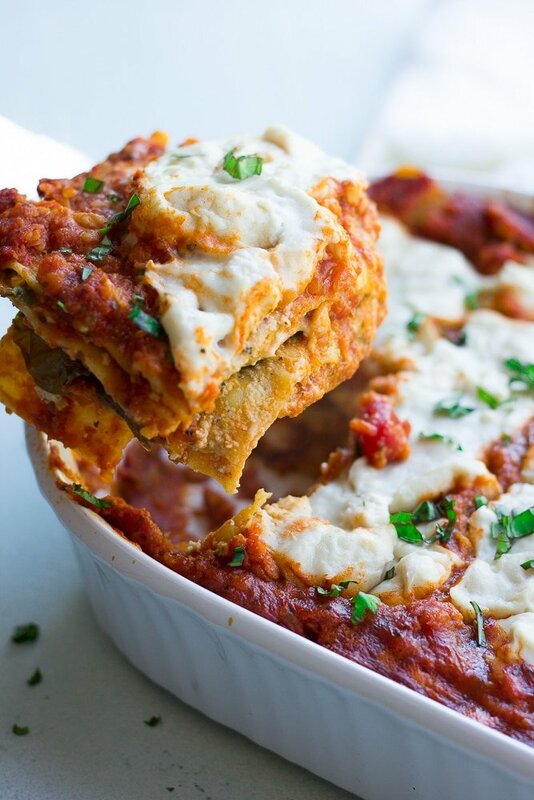 THE BEST VEGAN LASAGNA. After trying many different vegan lasagnas over the years since giving up animal products, I have finally come up with the WINNING RECIPE! At last, a lasagna that my whole family will eat without complaining. Now, I adore a lasagna filled with zucchini, mushrooms, spinach and whatever other vegetables you’d like to put in it. However my children do not feel the same way! They just don’t want chunks of veggies in their lasagna. So I compromised. There are still plenty of healthy ingredients in this vegan lasagna, such as red lentils, tomato sauce, tofu, cashews, spinach and whole grain noodles. And I promise, it’s delicious! Let’s talk about red lentils for a minute. They are my favorite lentil, especially for kids and picky eaters! Talk about a protein powerhouse. At 18 grams of protein per cup cooked, these add a TON of nutrition to this dish. And the best thing about them is that unlike green or brown lentils, red lentils kinda mush and mix in with whatever you put them in. They are almost undetectable, and in pasta sauce they simply help create a “meaty” type texture without being very “beany”. 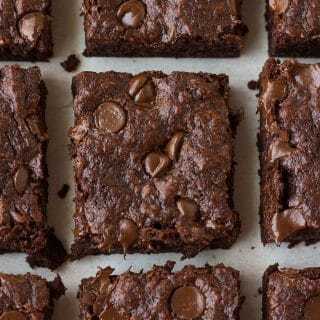 Perfect for picky kids (or husbands)! Do I have to pre-cook my lasagna noodles? No, you don’t have to pre-cook your lasagna noodles! That is one thing I just really can’t be bothered with. I mean, they all stick to each other no matter what I do, and the lasagna turns into mush in the oven. Trust me, this works and it’s the reason for the 2 jars of pasta sauce. I know it seems like a lot, but it works perfectly! 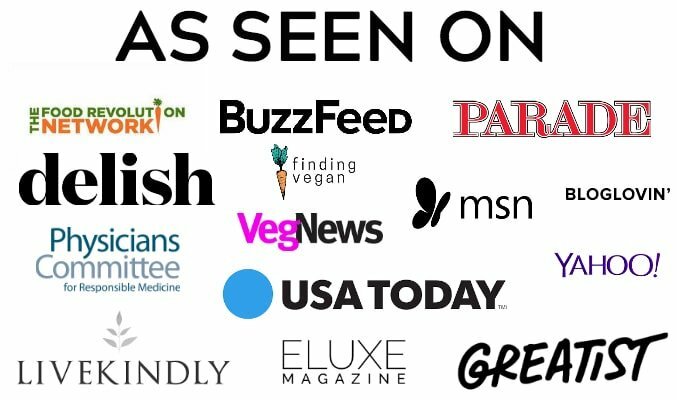 Want more delicious vegan pasta recipes? 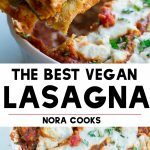 This is hands down the BEST Vegan Lasagna. 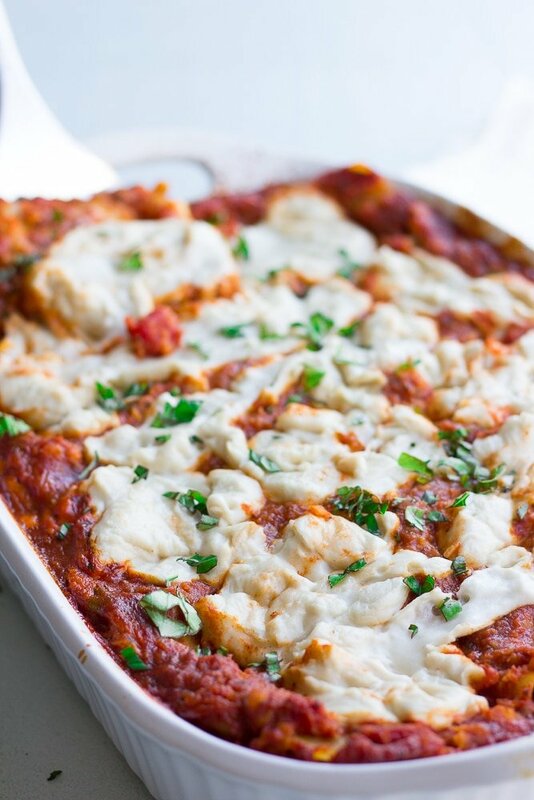 With a protein packed red lentil marinara sauce, tofu-cashew ricotta and lots of fresh spinach, this lasagna will satisfy everyone, vegan or not! First, cook your red lentils. Add 1 cup dried red lentils and 3 cups of water to a medium pot. Bring to a boil, and then simmer for about 20 minutes. Drain the lentils in a fine strainer, and then add to a large bowl. 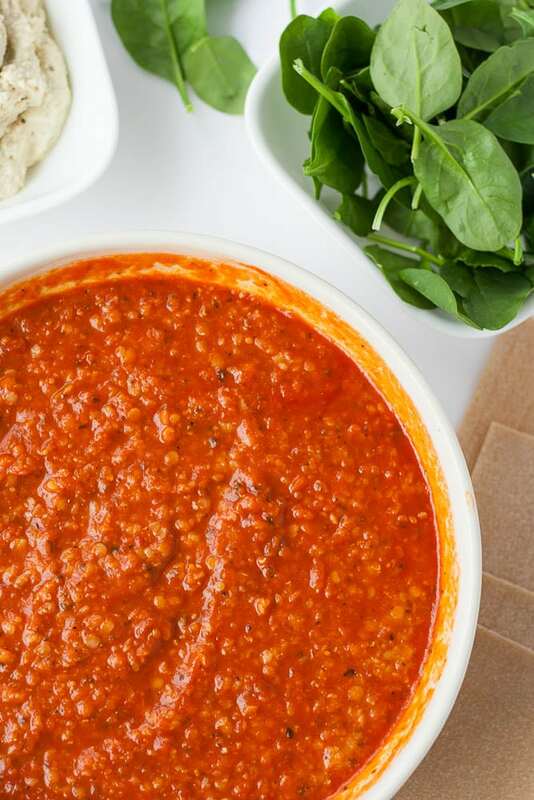 Add both jars of marinara to the bowl with the lentils and mix to combine. Set aside. Make the Cashew-Tofu Ricotta: Add the cashews to a food processor and process until fine and crumbly. Then add the tofu in chunks, nutritional yeast, lemon juice, salt, basil, oregano and garlic powder to the food processor. Pulse until well combined and pretty smooth. Assembling the lasagna: Add about 1 cup of marinara sauce to the bottom of a large lasagna pan. 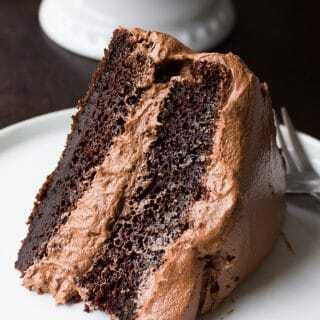 Spread it around evenly. Next add 4-5 lasagna noodles (uncooked). Spread half of the Cashew-Tofu Ricotta on top of the noodles. Top with half of the spinach. 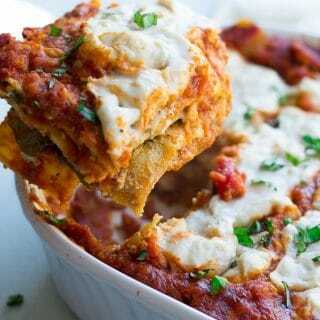 Add about 1 cup of the marinara sauce over the spinach, then place 4-5 lasagna noodles on top. Spread the rest of the Ricotta over the noodles, then the rest of the spinach. Place 4-5 more noodles on top of the spinach, and then pour the rest of the sauce over the top, evenly. While the lasagna is cooking, make your Vegan Mozzarella Cheese, if using. If using the mozzarella topping, simply remove the lasagna after 40 minutes of cooking in the oven. Spoon on the mozzarella, and pop it back in the oven for another 20 minutes. Remove, let cool for at least 15 minutes and serve.